MINT MAYS!!! Willie Mays irrefutable standing as our National Pastime's "greatest living ballplayer" is synonymous with this truly remarkable PSA Mint 9 "gray back" gem that stands as one of his finest 1956 Topps cards extant. To date, not a single PSA specimen has managed to achieve a higher grade, and elite PSA Registry collectors can surly appreciate the significance of owning one of the pinnacle Mays cards on the planet! Piggybacking off of their very successful 1955 "landscape" issue, Topps would once again produce a landscape card for their '56 set that would utilize the same Mays portrait image and a new "sliding" pose. Mays would not disappoint his fans throughout the '56 season, walloping 36 round-trippers and stealing 40 bases for the only time in his legendary career. 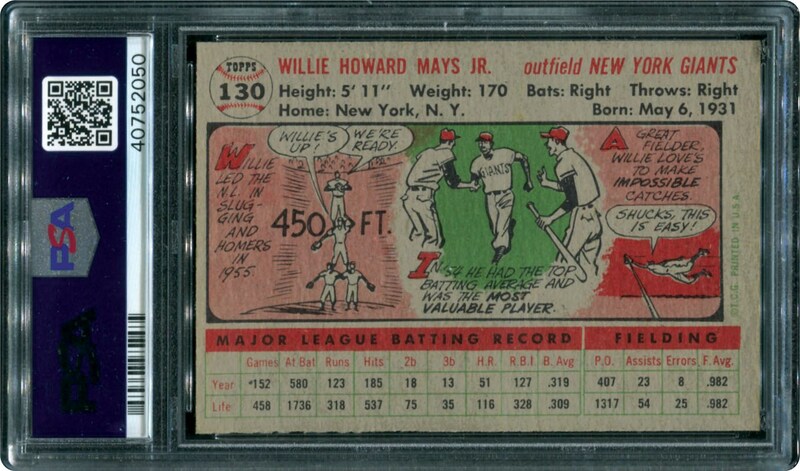 One of the most popular of all the "Say Hey Kid's" coveted cardboard issues, its richly hued images, dazzling white borders, gleaming surfaces, pinpoint corners and strong centering all combine to substantiate the sanctified "Mint" assessment. 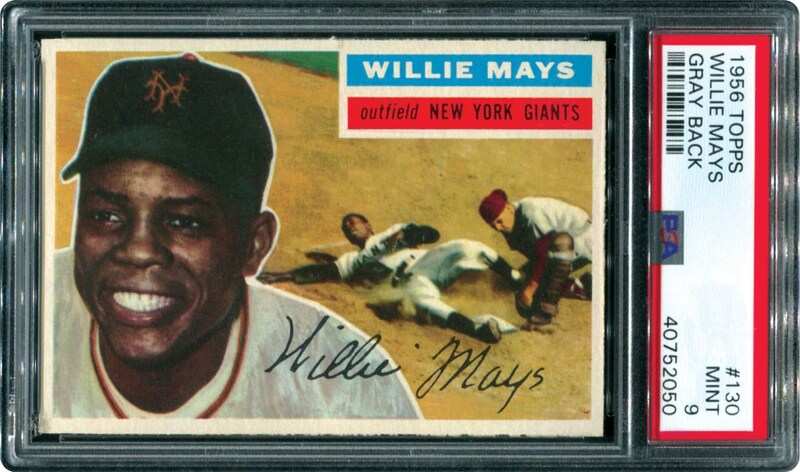 Arguably the greatest "5-tool" player in MLB history, Mays could hit, run and field better than nearly all of his peers, justifying why this "highest-graded" '56 gem resides as the perfect testament for his unbridled legacy!